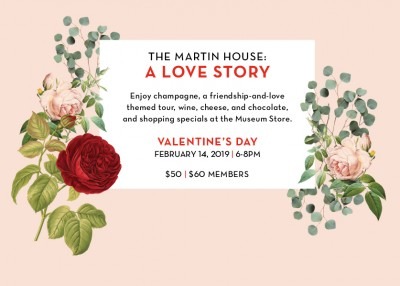 Whether you're part of a duo, flying solo, or planning a “Palentine’s/Galentine’s” day with friends, we invite you to the Martin House on Thursday, February 14 for a special evening. Gather with a glass of champagne in the lower level of the Martin House and then embark on a special tour, exploring the themes of love, friendship and family. Cap off the evening with wine, cheese and chocolate (of course!) in the Museum Store where you can treat yourself or that special someone with thoughtful, design-inspired gifts. All guests will receive 20% off their Museum Store purchase. The event begins at the Martin House, 125 Jewett Parkway, 6-8pm.